First, I want to say thank you to everyone who inquired about my well-being during my blogging absence. I chose not to blog for the bast few months because I was experiencing a time in my life where I wasn't able to express my thoughts in a positive manner. Rather than have my blog become an outlet for negative energy, I opted to maintain a private paper journal. But things are on the mend and I want to share a story. Several months ago, DH attended the funeral of his grandmother. It was in a different part of the country and he had other family business to attend to at the same time. Sadly, we opted for him to go alone while I stayed home with the girls. While at the visitation, he removed the girls' school pictures from his wallet and sent them on with his grandmother. 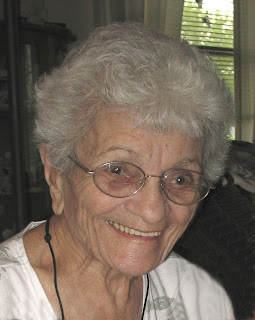 Last weekend, at the seasoned age of 93, my grandmother "GG" passed away. I'm proud to say that she was a wonderful woman that lived independently until her last day. My daughters loved her and DH often suggested we pick up fast food and swing by to see her. She always welcomed us and we always enjoyed seeing her. A feisty little Italian, she was fun to spend time with. Although skeptical, we took the girls to the visitation and the funeral. We prepared them ahead of time as much we could, explaining that we first were going to someplace to be sad with other people who were sad that she passed away. Then the next day we would attend church to say goodbye for the last time. We answered any question as best we could. At the visitation, we kept them at a distance until they asked to go closer to see her. Surprisingly, they weren't scared or freaked out. They were sad and wanted to touch her. Miss K was very curious, continually asking questions about the whole thing. Miss M was just sad that she wasn't coming back. At one point, DH and Miss K were alone at GG's side. DH removed Miss K's picture from his wallet and let her place it in with GG. He got Miss M and allowed her to do the same thing. Both girls were proud to give GG their pictures. Shortly thereafter, one of my aunts gave Miss K a few photos of their family and her grandson helped Miss K add their pictures to the ones of my girls. After that, a couple of my tween cousins got their school photos, wrote goodbye notes on the back and added them to the collection. By the time visitation was over, there was a photo of almost every great-grandchild...ensuring that GG wouldn't be alone on her next journey. Although it was a sad time for our family, this small ritual seemed to give the children a connection and closure they might not otherwise have had. What started off as a simple gesture by DH at his own grandmother's funeral will become a tradition in our immediate family. Aww, that is really sweet and I think it is a lovely tradition. Glad to hear you are alright! Hope you and your family are healing after sending your grandmothers on to a new place with so many wonderful photos! I'm so sorry for your losses. I hope that you and your family are mending after these sad times. It will be nice to have you back whenever you feel you are ready to start writing again. Best wishes to you and yours. I was pretty young when my Granny died and I went to her visitation. I don't remember being scared by it at all, just glad to see Granny one more time before she was gone. It is very memorable experience, but not traumatic at all. I think it helps when parents share a death experience with kids and don't try to hide it from them. Good job. i was 3 year old when my grandma and my grandpa gone. Hugs and Kisses to you and your family. I'm sorry for your losses. That was a sweet gesture to start a tradition in the family. In that way it was easier for the family specially the kids to have closure and acceptance. Ohh wow that was such a touching story, sorry for your loss, but that story of the pictures was amazing. Sorry for your loss. What a lovely blog. I am sorry for your losses. What a wonderful idea to send the pictures. Its really nice to read this detailed post.I think this post is showing your love for your grand mother.But one thing is strange for me that chocolate was her medicine.How could this possible?